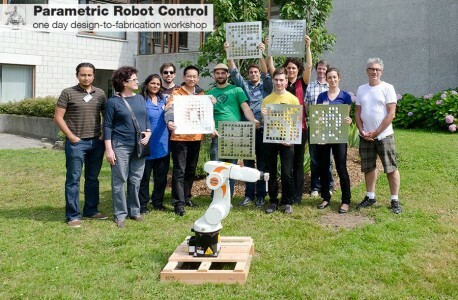 Hopefully we’ll meet many of you fellow robot-handlers there! We recently presented our paper “A New Parametric Design Tool for Robot Milling” at the ACADIA 2010 conference in New York. We had a great time there and thank all of our friends who got up on a Sunday morning – after the big party, no less – to follow our presentation. In our paper we show approaches on how to integrate the robot not just in the parametric model, but in the design process itself. 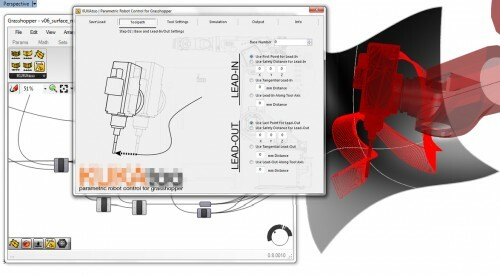 The example above is a screenshot (with added captions) directly out of Grasshopper, showing the initially created curves, the resulting modules and finally the stacked wall – side by side with a preview of the toolpaths, including the possibility to simulate the end-effector movements and extract KRL (KUKA Robot Language) code. It’s all running very fluently, allowing you to quickly iterate alternatives, both in respect to design and production. Finally, due to the KRL code generation, you can also rapidly output KRL files for mass customization, circumventing the lengthy CAD-CAM-Postprocessor workflow.